After “Buffalo” Bill Cody (Joel McCrea) rescues a U.S. Senator (Moroni Olsen) and his beautiful daughter (Maureen O’Hara) from a stagecoach attack, he falls in love with and marries O’Hara, who struggles to adapt to life in the West. 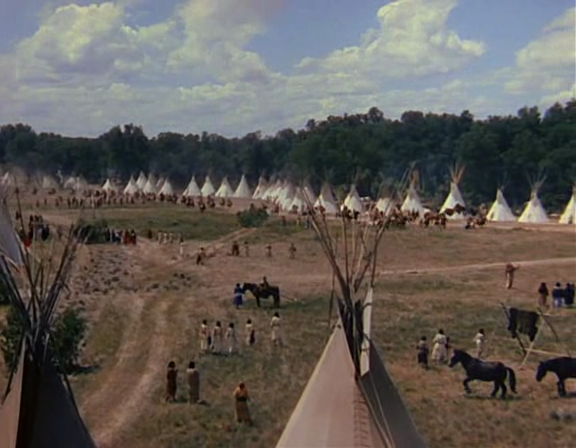 Meanwhile, McCrea tries to help broker peace with local natives — including Cheyenne Chief Yellow Hand (Anthony Quinn) and his sister Dawn Starlight (Linda Darnell) — and tells stories of his adventures to a travelling writer (Thomas Mitchell). 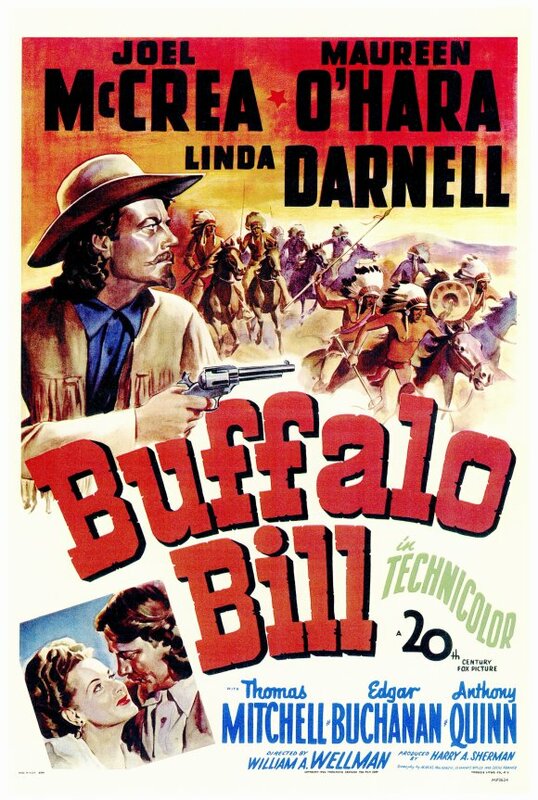 …meant to be a more cynical look at the legend of Buffalo Bill, but as Wellman described it to Richard Schickel in The Men Who Made the Movies, his co-writer decided that he didn’t want an American legend to be destroyed in that fashion, so the script was discarded and this more sanitized version was produced. Wellman was somewhat ashamed, as he put it, of the finished product, in particular the end. Cody is shown as generally sympathetic and supportive of Indian culture (and concerned about too many bison being slaughtered), but it’s hard to tell fact from fiction, especially given the critical intervention of ultimate storyteller and myth-maker Ned Buntline (Mitchell) into Cody’s life. O’Hara [entering her room and spotting Darnell in her dress, admiring herself in front of a mirror]: Who are you? [Darnell turns around.] An Indian! What do you mean by breaking into my room and stealing my clothes? Darnell: I… I didn’t come here to steal. O’Hara: Maybe you Indians have another word for it, but that’s my dress you have on. Darnell: I tell you I didn’t come here to steal. O’Hara: Perhaps you’ll explain to me just what you’re doing in my clothes! Darnell: I wanted to find out something. O’Hara: And just what, may I ask? Darnell: I wanted to find out… if I could be as beautiful as a white girl… in a white girl’s way. O’Hara [melts, as violins begin playing]: Oh… I see. [smiles and takes Darnell’s hand, showing her the mirror.] There’s your answer. You look beautiful. [beat] I wish your Indian brave could see you now. O’Hara: What is it? What did I say to offend you? Please… I’d rather you kept it. It was so becoming on you. Darnell: I don’t believe you! You don’t want it because an INDIAN wore it! [throws dress at O’Hara]. Indian! [said as she climbs out the window]. This scene could be deconstructed in countless ways — but suffice it to say that Darnell’s character is openly ashamed of being Indian, and only believes she can have worth (and Cody’s heart) by looking beautiful in a “white girl’s way”. Meanwhile, the entire romance between McCrea and O’Hara lacks conviction: we’re not given much insight into why Cody would be so attracted to her other than her beauty, and their ongoing clash in lifestyles (who knew?!) simply serves as a predictable plot element driving narrative tensions forward. Note: Nine years after his supporting role in Annie Oakley (1935) as Buffalo Bill, Moroni Olsen was cast in essentially a cameo role here as the father of the woman Buffalo Bill marries — a nifty touch for those keeping track. As also (humorously) noted at TCM: “O’Hara, in fact, later wrote that she believed it was the Technicolor photography that made the film such a substantial box-office success.” O’Hara also disliked the film. So, is it a bad film? Probably not – if you prefer legends. It’s a well-made film (and it does seem to make some admirable points) – but apparently it’s mostly hogwash. TCM finally notes: Fox released ‘Buffalo Bill’ before ‘The Ox-Bow Incident’, and while the former scored box-office gold, the latter made no dent with moviegoers, though critics loved it. In truth, Zanuck hated ‘Ox-Bow’ so much that he barely released it, so it never had a real chance. But ‘The Ox-Bow Incident’ has since become regarded as one of the great classics of the era, while ‘Buffalo Bill’ is remembered mainly for its rousing battle scene and technical merits.